Only seeing your children every other weekend can be devastating. You miss them when they are not with you, and those few short days does not give you hardly enough time to settle into a routine before they are whisked back to the primary custodial parent. If you only have standard visitation, this usually means that is the minimal allotted time you can spend with your children by law. By being respectful to your ex, using a little imagination and some ingenuity there are ways to see your children more. Be sure to read your parenting plan and decree carefully before taking any of the following steps, and if neither say you can’t do any of the following list, go and spend some more time with your kids! So what are you waiting for? As Nike says…Just do it! Nothing makes a kid feel more special than when a parent shows up with a bag of Mickey D’s under their arm at lunch time. Generally, the decree will not stipulate that you are not allowed to visit your child at school, and most schools will allow you to bring lunch to your child. Email the teacher and let them know ahead of time that you are coming and enjoy lunch and maybe even recess with your child! You will not only be your child’s hero, but you will be the envy of all their friends. I don’t know about you, but our little league has two practices and one game every single week. 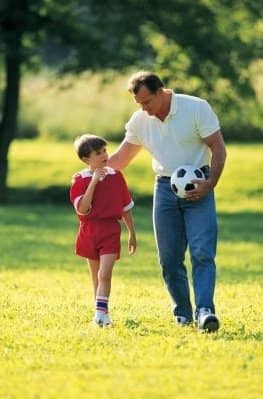 Not only will you get to spend that extra time with your child, but team sports are great for kids because they teach them socialization, the art of winning and losing and how to be a team player. All lessons that will add value to their lives. Discuss it with your ex first, keep them informed of practices and games and let them know that you will take care of everything. They will be grateful that you co-parented and are bearing the brunt of all that work. Your child will be thrilled and you are once again a hero. Your ex will most likely welcome the break, and if they don’t usually do the picking up, then let them know you have made arrangements with who does pick them up and you will be doing it. Be sure to explain to your ex that you have the time to do it and would love to help lighten her load. After you pick up your child, take them out for ice cream and help them with their homework. Not only does that give you some extra time, but also gets a very important step done that the primary caregiver generally stresses over. You get the whole day to spend with your child. I realize, many of you are saying…but, we have to work! Take the day off. What is more important? This is a special day and memory that you can create with your child and it is above and beyond your usual custody arrangement. Once again, check with your ex and see if they are planning on chaperoning for the field trip. If they are not, email the teacher and explain how important it is for you to be there and how much you are looking forward to it. Even if that teacher has enough parents for that event, I guarantee they will always take one more. No, this isn’t one on one time, but you see him or her and more importantly, they see a parent who is there to support them and cheer them on. Often times, parents without primary custody do not attend functions. Sometimes it is because they are not aware of them. But, you are entitled by law to be aware of them. Make sure you are on the email list for the school, and surprise your child with your presence there. These are important times in your child’s life and these are also things they will remember. Make them more memorable by being there. If you make your ex think you are doing them a favor, they will be grateful and be more agreeable. It is better than paying a babysitter, trust me. Arrange to pick your child up at the same time they would be going to school and to drop them off at the time when school is normally out. Don’t rock the boat by asking for extra time during these days. If your ex is agreeable this time to you taking your kids, then think about how easy it will be next time, and eventually, it could lead to more time with your children. Keep the big picture in mind. Most decrees or parenting plans allow a parent who is not the primary custodian to spend a few hours with their children on their birthdays. Tell your ex that you would like to be there for the party, even if it is just to watch them blow out the candles. If they are disagreeable, offer to pay for half of the party to attend. Most will agree when it comes down to the all mighty dollar and they have to spend less. If your ex works, then child care is needed. Offer to pick the kids up after you get off of work, or leave work early once a week and pick your kids up from the caregivers. It will save your ex money for the child care and once again, it is always better for the child to be with a parent than a caregiver. Tell your ex that you will bring them home when they get back from work. They will appreciate that they can save some money and the fact that you are not taking advantage, but truly offering to help. If your ex is resistant to it, gently remind them that you are happy to add the first right of refusal into the decree if it is not already in place. by Lee Block, Post-Divorce Consultant and Author.